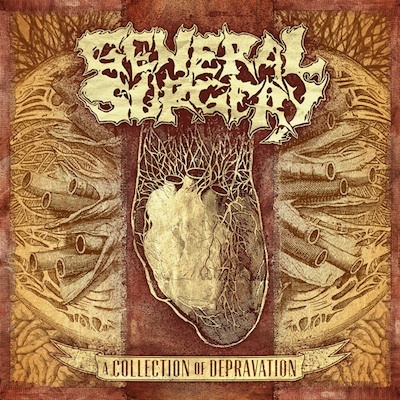 Relapse Records is extremely proud to announce the official re-signing of Swedish goregrind legends GENERAL SURGERY! Originally formed in 1988, GENERAL SURGERY (Joacim Carlsson  guitar, Andreas Eriksson  bass, Andreas Mitroulis  drums, Erik Sahlström  lead vocals) released the seminal Necrology EP via Relapse in 1991 before going on a long hiatus until 2002. The band released numerous splits, EPs, and two full-length albums since then and will be coming back in a blood-soaked rage in 2012! A Collection of Depravation, a compilation of 30 GENERAL SURGERY choice cuts will see its official release via Relapse on March 27th and is available for pre-order here. The collection was digitally remastered by Pig Destroyers Scott Hull and contains a 24 page booklet with extensive liner notes from the band. We are honored to announce that we will once again be working with the label that started us off (and in a way, we helped get off to a good start too back in 1990). Things are indeed coming full circle as we enter another phase of our gristle spattered career. The seeds for this collaboration were sown during the process of re-releasing the Necrology EP last year, where both parties felt that further co-operation would be just the right thing for the future. Coming up immediately is our new 30-track collection CD, ”A Collection of Depravation”, brimming with old putrefying cuts from our earlier split releases. Following that will be a 5-track 7″ EP entitled ”Like An Ever Flying Limb”, recorded during fall 2011 at Audiohammer (Swe) studio. As if that wasn’t enough, there will be a 3rd full length album to look forward to in the not so distant future. Join us in the celebration of blood soaked shenanigans that is 2012 – GS and Relapse will bring you nothing but the best as usual! GENERAL SURGERY are available for interviews upon request. To get in touch with the band, simply contact bob@relapse.com. Stay tuned to www.RELAPSE.com and the official GENERAL SURGERY website and Facebook page for the latest GENERAL SURGERY information. We finally got around to releasing one of the most requested items in the history of the band: all of our split releases on one CD – ”A Collection of Depravation”. Release date is March 27th. Contains the out-of-print splits with The County Medical Examiners, Filth, Machetazo, along with plenty of unreleased material from the Left Hand Pathology sessions, the Butcher ABC split sessions and the Corpus In Extremis sessions. To top it off, we’ve added the Carcass cover we recorded back in 2001 as a bonus track. 30 oozing cuts in all, plus a 24 page booklet with extensive liner notes. Also, all songs have been remastered by Scott Hull from Pig Destroyer for maximum audio fidelity. Pre-order it from the Relapse web store. ”Due to increasing personal commitments and lack of time I am unfortunately forced to leave the team of surgeons. I´d like to wish my past fellow medicals all the best for the future, and thank them for these 8 years of unruly scalpel marathon, as well as send out a big cheers to all the fans, promotors who booked us and bands we played with during these years. The rest of the surgery team are of course sorry to see Dr Wallin leave our ranks and wish him all the best for the future. We sure had a good run and Dr Wallin’s contribution will not be forgotten. Right now we are in the process of finishing up our collection of old split releases to come out on CD for the first time. More info on the release date and the label releasing it as soon as we get word. We have also recorded five new songs during the fall which will be released as a 7″ on said label at some point during the new year. In other news, song writing for the 3rd full length album has commenced. To sum it up, lots of new product coming out from us in 2012 and for now we will be continuing as a 4 piece unit writing a new album. Sickly splattering sounds will be coming your way in 2012 – the gore won’t stop! Copyright © 2009 General Surgery	 WordPress Theme by Michael Tyson.